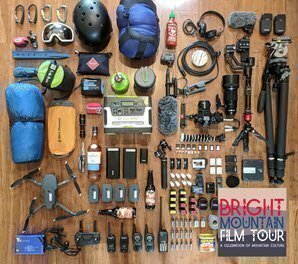 The Bright Mountain Film Tour (BMFT) is a celebration of mountain culture and those who embrace it. The best adventure films from around the world are showcased amongst the alpine communities of North East Victoria. This​ ​year​ ​BMFT3​ ​will​ ​feature​ ​some​ ​epic,​ ​home-grown,​ ​Aussie​ ​adventures​ ​and​ ​some​ ​awesome female​ ​adventures,​ ​recognising​ ​the​ ​diversity​ ​in​ ​adventure​ ​sports. Bright has become the epicentre of mountain sports with visitors from around the world enjoying everything the town and surrounding area has to offer. The BMFT is not just a film festival, it’s a community celebration. The films are handpicked by a panel of local enthusiasts, all experts in their related fields of filmmaking, mountain sports and tourism. Sit​ ​back​ ​and​ ​feast​ ​your​ ​eyes​ ​on​ ​some​ ​of​ ​the​ ​world's​ ​best​ ​outdoor​ ​adventure​ ​films​ ​with​ ​a​ ​cold​ ​refreshing​ ​ale from​ ​Bright​ ​Brewery​ ​or​ ​a​ ​locally​ ​produced​ ​wine.​ ​Arrive​ ​early​ ​and​ ​enjoy​ ​the​ ​family​ ​friendly​ ​expo​ ​with​ ​product exhibitors​ ​and​ ​fundraising​ ​food​ ​stalls​ ​led​ ​by​ ​local​ ​community​ ​groups. Tickets are not refundable however they are transferable to other people.